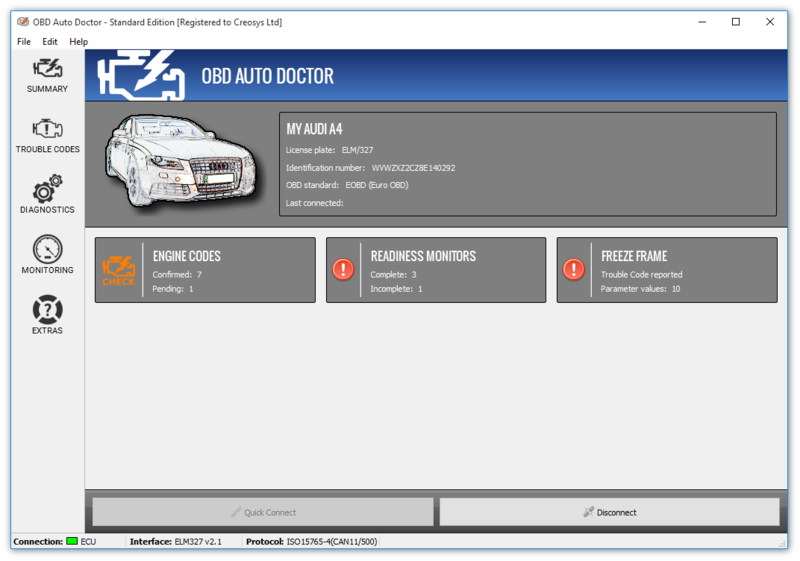 OBD Auto Doctor is the advanced OBD-2 software for Windows, Mac and Linux. The software enables you to communicate with your vehicle's On-Board Diagnostic system and turn your computer into a highly capable automotive scanner. OBD Auto Doctor is a must-have tool for everyone interested in getting to know their cars better. Whether you want to monitor data in real-time or reset "check engine" light, this is the only OBD-II software you need! OBD Auto Doctor works with both gas and diesel engines. The only requirement is that your car is OBD-II compliant. Depending on your car, you might be able to talk, for example, to transmission controller in addition to the always supported engine controller. Confirmed Codes indicate confirmed malfunctioning components. These may require vehicle service to fix. Pending Codes indicate temporary failed components. These don't necessarily imply malfunctioning component. Permanent Codes indicate historic confirmed codes. These will be cleared only by the OBD system automatically. 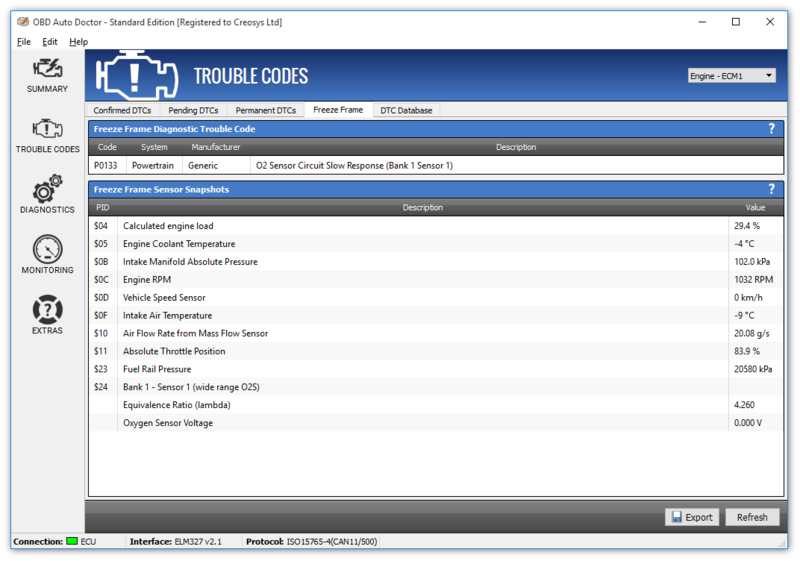 In addition to reading the generic and manufacturer specific diagnostic trouble codes and freeze frame, you can also reset the DTCs. This will also clear the Check Engine Light. The software contains also offline DTC database for searching and browsing all the trouble codes. 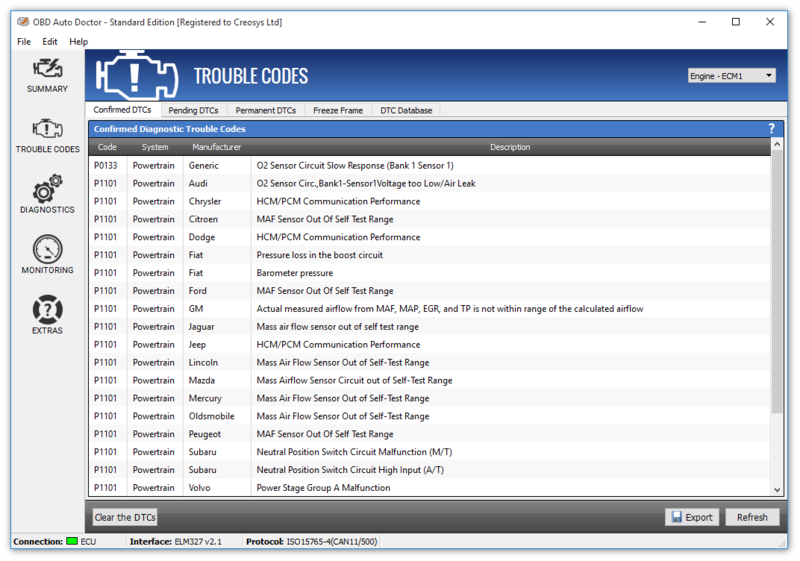 The DTC database contains over 14000 trouble codes that the software has description for. 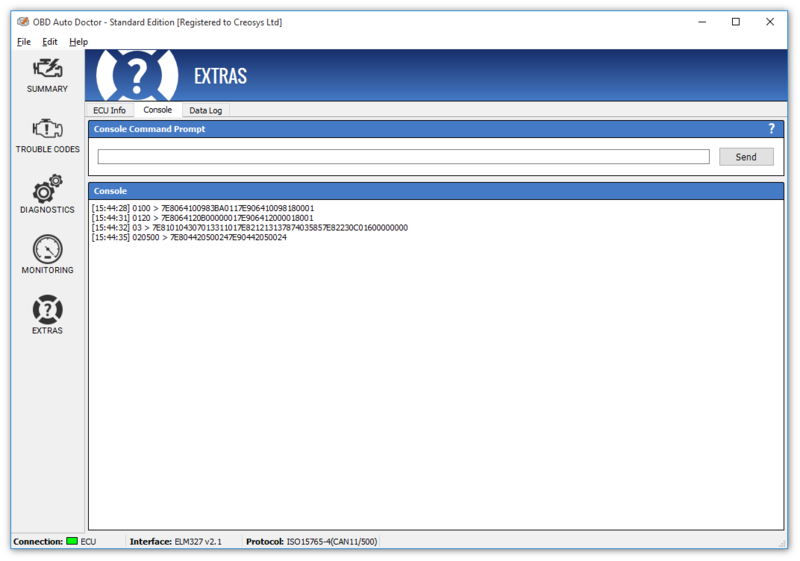 Starting from version 2.0, it's also possible to export or save the Diagnostic Trouble Code and Freeze Frame information to a text file. The file can be then easily shared with others, or archived on a disk for later need. Read: What to do when Malfunction Indicator Light illuminates? The purpose of readiness monitors to vehicle is to self-test their emission systems. Vehicles perform up to 11 system tests, these are so called readiness monitors. The readiness monitors identify whether the vehicle's computer has completed the required tests while the vehicle is being driven. Status since DTCs cleared. These self-check routines are reset only when the Check Engine Light and the Diagnostic Trouble Codes are cleared. Status for this driving cycle. 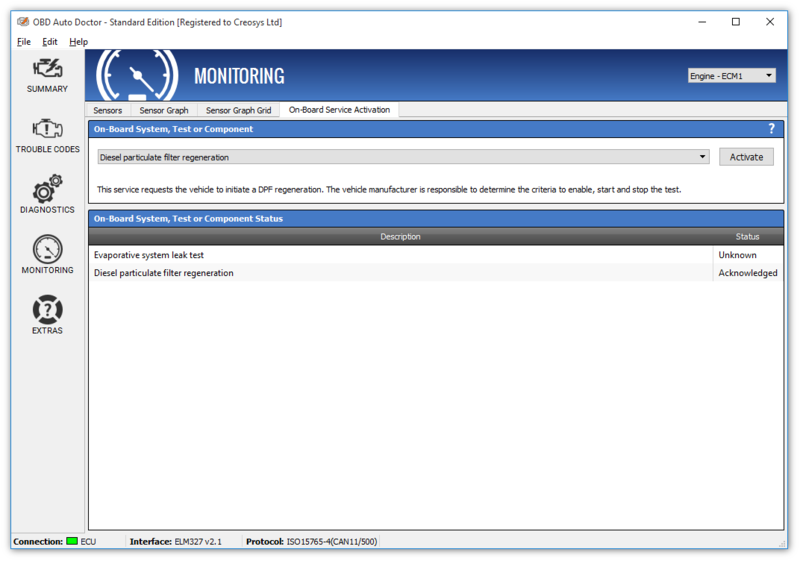 The completion criteria is reset to "Not ready" upon starting a new monitoring cycle. Note! Depending on your country, OBDII vehicle may not pass the annual inspection unless the required monitors are "ready". For example, the US Environmental Protection Agency guidelines allow up to two monitors to be in a "not ready" state for model year 1996 through 2000 vehicles and one monitor "not read" for 2001 and newer model year vehicles. 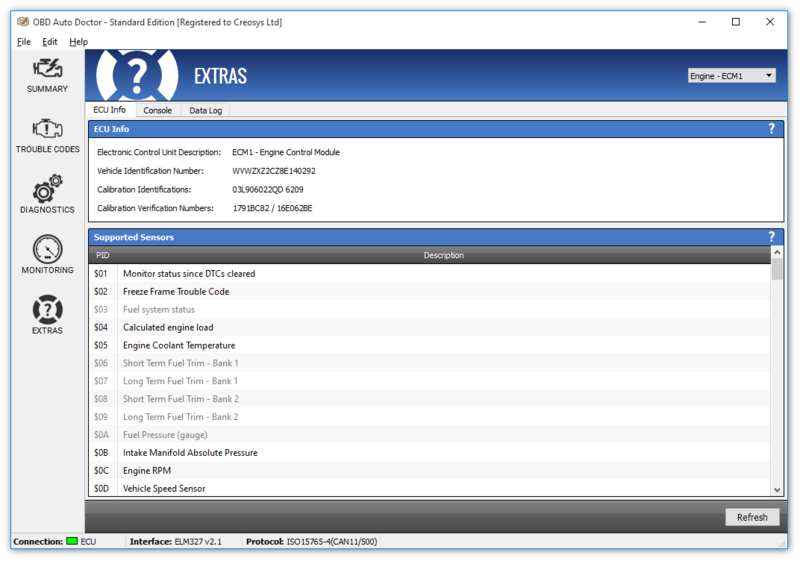 Now you can check the emission readiness yourself! Sensors and parameters are what most of you find the most interesting part of the software. You can monitor all the sensor values that your car reports in real-time. The software updates the values in sequential order as fast as possible. The speed depends only on the adapter. The more expensive genuine adapters will perform faster than the cheap clone OBD2 adapters. In addition to showing the current values, minimum, average and maximum values are provided too. Some typical sensors include engine coolant temperature, fuel pressure, intake manifold absolute pressure and air flow rate from mass air flow sensor, to list few of them. The software has support for over 126 powertain parameters (PIDs) in the range of $00 - $7F. You can pick the most suitable data reading units; both metric and imperial (English) units are available. You can also export or save the live sensor data to a .csv file. This file can be opened with Microsoft Excel or Google Sheets, for example. These external tools allow you to create custom graphs of your data. The Sensor Graph or oscilloscope can plot any numeric sensor value that is supported. 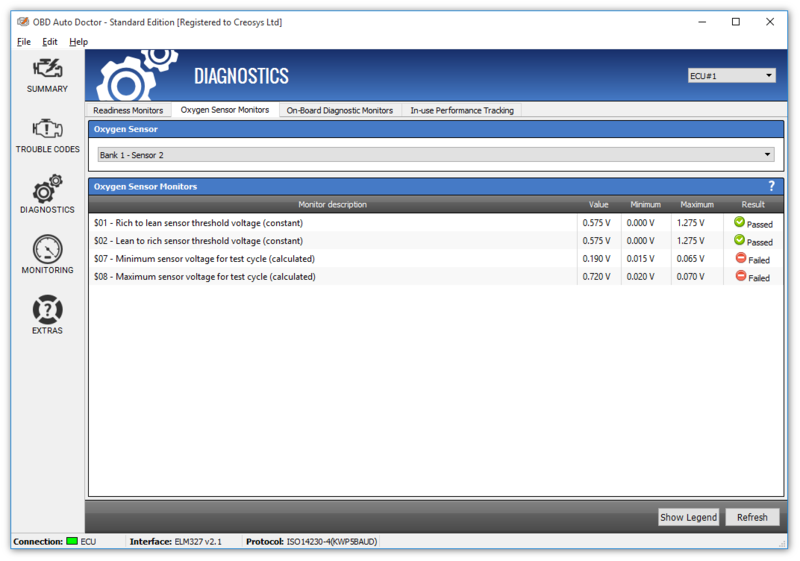 With the OBD oscilloscope, you can visualize sensor value changes easily. Graphs are great tools because they communicate information visually. Even large amount of data, or fast changing data can be interpreted much better when expressed as a graph. Graphs help you to identify sudden spikes and trends in the data. 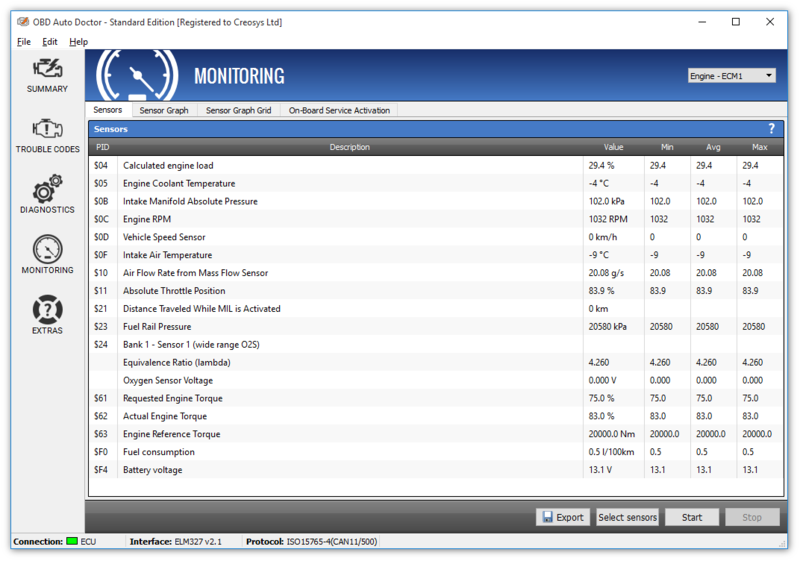 In addition to visualizing the numeric OBD data, our software enables you to save the graphs to your computer as image files. You can share the images with your mechanics or friends, or you can post them to automotive forums when asking repair advice from fellow DIYers. 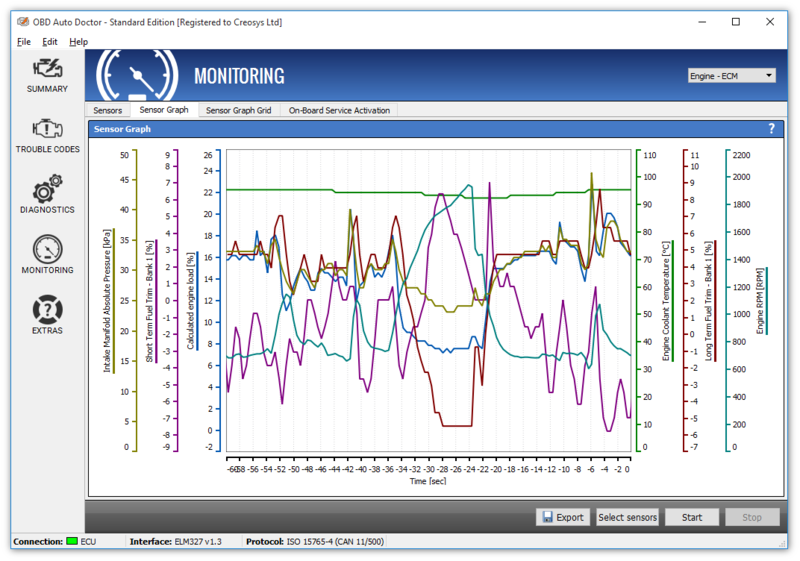 The current version of the software allows you to pick up to 6 sensors to monitor simultaneously. 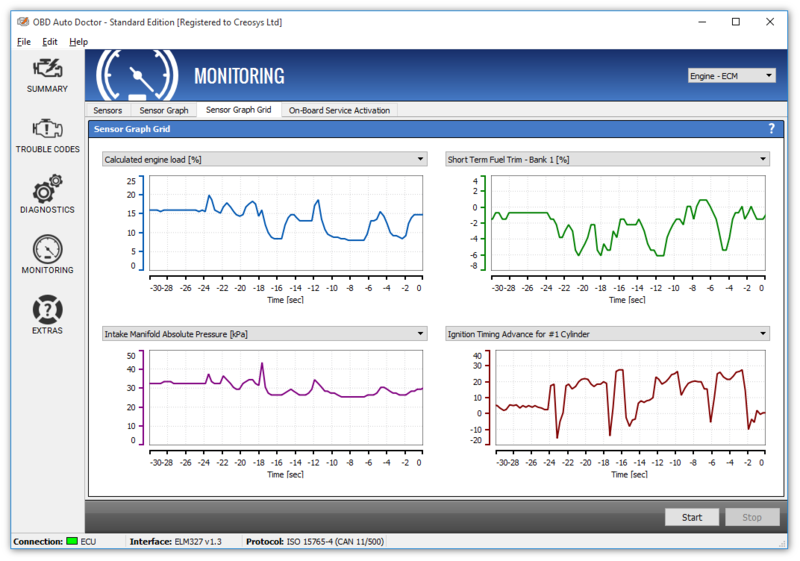 With the Sensor Graph Grid you can monitor up to four different sensors side by side. Each of the sensors have their own graph. In some cases this makes it easier to interpret the data compared to the Sensor Graph. You can pick any supported sensor with numerical value to the grid. The graphs are updated as fast as the car and adapter provides the data. 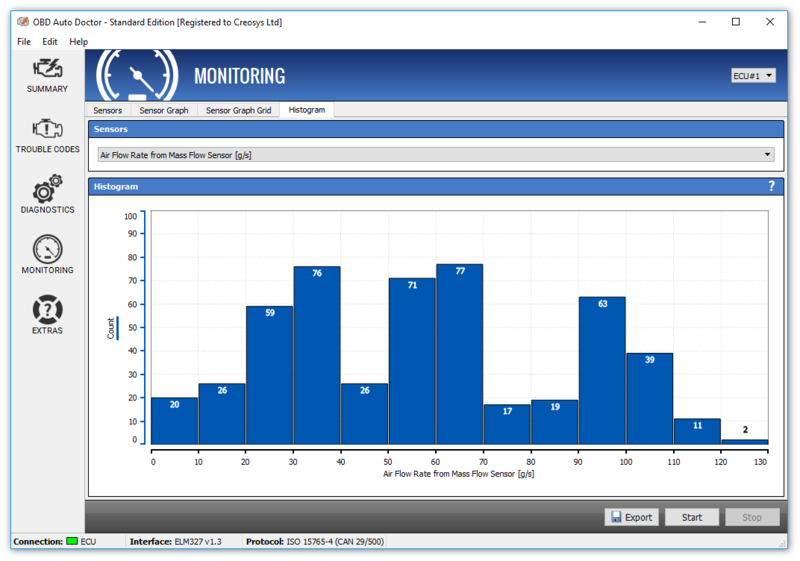 The newest addition to the monitoring toolkit is Sensor Histogram. Histogram is an invaluable tool for data visualization in sensor data analysis. It can help you identify the distribution of different values within the mass of raw data. You can pick any supported sensor with numerical value to the histogram. The histogram is updated as fast as the car and adapter provides the data. Oxygen sensor monitoring test results provide measurement data from the oxygen sensor monitors. The data include current test values as well as minimum (the minimum value to which the test result is compared) and maximum (the maximum value to which the test result is compared). This service is OBDII MODE $05 and it shall be available only on vehicles using ISO 9141-2, ISO 14230-4 or SAE J1850 protocol. On-board monitoring test results for Specific Monitored Systems provides access to the results of on-board diagnostic monitors for specific components and/or systems. Examples of these are catalyst monitoring and the evaporative system monitoring. The components and systems are either continuously monitored (e.g. misfire monitoring for gasoline vehicles) or non-continuously monitored (e.g. catalyst system). 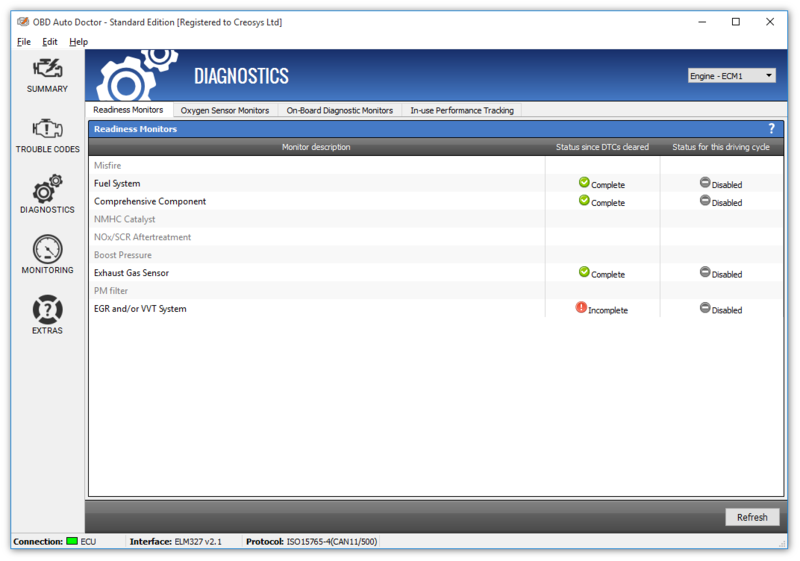 In addition, this service can be used as an alternative to the OBDII MODE $05 to report oxygen sensor test results. This service is OBDII MODE $06. It shall be available only for ISO 15765-4 (CAN). On-board service activation enables you to control the operation of an on-board system, test or component. While most OBD2 services simply read information from the car, this service allows bi-directional communication. The service basically allows you to command the vehicle's on-board system to initiate or perform specific tests. In that sense, this service or mode is rather powerful tool. You can follow In-use Performance Counter values in this view. These counters show the number of times the component or system conditions have been encountered. Check out ECU name, Vehicle Identification Number (VIN), Calibration Identification (CALID) and Calibration Verification Numbers (CVN) plus the supported sensors. The console view is targeted for advanced users only. With the console you can troubleshoot problems by sending custom commands directly to the vehicle. Only for those who know what they do!